Today I want to talk to you about how much money you SHOULD borrow for a home. 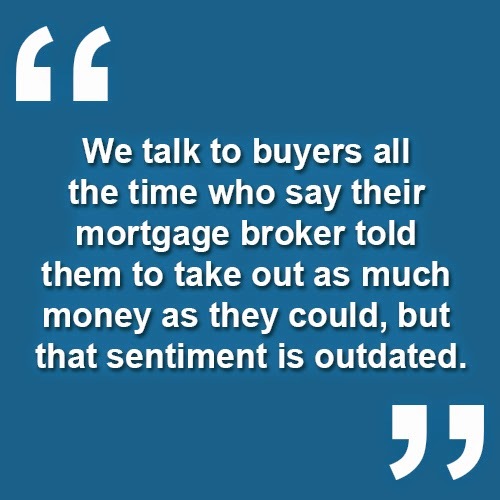 We talk to buyers all the time who say their mortgage broker told them to take out as much money as they could, but that sentiment is outdated. I took some time to ask my mortgage brokers what they would recommend for home buyers, and what they had to say was enlightening. They said they need to look at your finances with a holistic approach, to help you understand exactly what your monthly budget looks like, and then fit you with the right product. Not everybody should take out as much as they can. There are plenty of other ways you can put that extra money to work, without having to pay interest on it. If you take out $50,000 less on a mortgage, you are going to have an extra $200 per month to go to work for you and your home in whatever way you deem necessary. So make sure you are working with a mortgage adviser who will help you look at your financial picture in a holistic manner, because that’s really what you need when you are out there buying a home. If you have any questions, I’d be glad to answer them. Just give me a call or send me an email, I look forward to hearing from you soon!